However, I accept very few weddings and have limited time. I have greatly appreciated those who helped me get started in my journey of learning (a process I am very much still a part of) and I put this page together to provide tips/help for others who are just starting into wedding photography. But, wow - things have changed! I started this page back when film was commonly used to photograph weddings and information about photographing weddings online was scarce. I've updated the page a few times, but now in 2018 as I'm updating my site the information is becoming somewhat dated. I'm leaving the content here on the site as some of the information and advice is timeless. Best wishes in your quest to learn wedding photography! Previously, I was creating an eBook "How to Photograph Weddings". The project became too big and I stopped work developing the resource. I had an email list and an 8-page PDF of tips for signing up for the email list. As I am not working on the eBook anymore you can view the tips without needing to sign up for anything. I have a lot of visitors to my site who are amateur photographers interested in learning wedding photography and want wedding photography tips. I have been surprised at how many wedding photographers have submitted questions in my Wedding Photography Question and Answer section. While I have much to learn, I have been very blessed by a few photographers that helped me out as I was learning - and my goal with this page (and more sections that are to come in the future) is to help aspiring wedding photographers. In May-June 2014 I updated the text on this page. There are about 11,000 words here - so it's long. In my spare time I was busy working on a comprehensive introduction to Wedding Photography which is well over 100,000 words (and full of sample photos) that I was planning to release as an eBook - however, that project got tabled. One of the biggest questions I've wondered is this: why is there such a lack of basic information on how to photograph weddings? Why do all of the wedding photography books I have seem to offer so little on how to actually light and shoot a wedding? Realistic lighting! Not studio lighting. And why is some of the information that is out there so old or bad (how many people have heard about indoor on-camera flash photography with the camera and flash set to F8 or F11 to have sharp focus - with the result being a "black background" and/or "cave photography"??). What equipment should I use to photograph weddings? Or, do you have any 35mm wedding tips? What digital camera do you use to photograph weddings? What exposure should I use for a candlelight wedding? Or, what are wedding low light camera settings? How to photograph a candlelit procession? What are the largest prints that can be made from 35mm film? What lenses work the best for wedding photography? What film do you recommend for photographing weddings? What type of digital camera should I buy? How do I avoid harsh shadows when taking outdoor pictures? Should I use a filter during wedding photography? What books are best for beginning Wedding Photography? Do you show your digital pictures at the wedding reception, for the guests to choose the photos they want? How many pictures are typically taken at a wedding? Exposure modes (auto vs. manual) and blurry photos. What image editing software do you use? Do you allow other photographers to take pictures at your weddings? Links to other wedding photography FAQ's on the web. However, it seems like the question that sums everything up, is, "My friend has asked me to photograph their wedding, do you have any advice for me?" And, I think that is why many professional wedding photographers are "tight" with giving out information. I think many do not want to inspire a bunch of amateurs to go out and take bad wedding photos. While I can see their point (as I, too, don't want to inspire people to go out and take bad wedding photos), I am of the opinion that everyone has to start out at some point. I also believe that an inspired and skilled amateur who is willing to prepare and work hard is capable of taking better photos than some working "professionals". Yet notice the emphasis on preparation and working hard. That will be a recurring theme on this page. And, to top it off, you can watch the professional (from a distance - without getting in the way) at the wedding and learn from them... Who knows, you may even be able to sign on as their assistant for the day. However, chances are, if you are looking for wedding photography tips, you've already decided to do it and aren't interested in me (a wedding photographer), giving advice that seems somewhat biased. If that is the case, this page contains my honest advice on how to get the best results taking wedding pictures. You'll need to plan on spending hours upon hours preparing for your first wedding (taking test photos, learning your camera, studying web sites) and I would also suggest you buy a few books (I've written some reviews of wedding photography books that are currently available - and given recommendations on which book I think would be most helpful for you - at the bottom of the page). Do not spend all of your prep time surfing the web and reading books. I strongly recommend you spend half of your time researching and learning, and the other half of the time with your camera in hand practicing. Think about wedding photography as being similar to performing with a musical instrument. Yes, with a musical instrument you can read and study about the instrument, and you can spend time listening to and watching great musicians perform, and yes you need to know how the instrument works, but if you spend all of your preparation time doing those activities and never practice using your instrument: you will be disappointed with your performance. If you cannot go to the church where the wedding will be held and take properly exposed, nicely-lit, well-composed images right now, how do you expect to be able to do so when you walk in the door on wedding day? Wedding day will not magically improve your photographic skills, if anything, due to the stress and amount of "stuff" going on on wedding day, you will probably take lower-quality photos on wedding day than you could on a practice day. Yet how many amateurs will invest the time to not only practice before wedding day, but perhaps practice multiple times. Make sure you, and your friend, understand what you are getting into. You need to realize that their expectations are probably higher than you would like. They've been surfing the web and seeing beautiful wedding photos. You need to lower their exceptions. That way, if (when?) something goes wrong there will not be hurt feelings, or, there will be "less hurt" feelings. That way, if your photos do not turn out as good as they could (should) have, you will still hopefully have a friend. If they are expecting snap-shot quality images they won't be disappointed in snap shot-quality images, and will actually be impressed with any shots that are better than average quality. Set expectations low. At the same time you need to realize that you are making a commitment. You need to not only capture the right moments at their wedding, but do it with reasonable quality. You can't mess up. You can't miss their first kiss as husband and wife because your auto-focus was racking in and out. Your photos had better turn out looking good. Yes, there is pressure in wedding photography. Yes, it's normal to feel a bit sick before the wedding (I have an entire chapter in the eBook on how to practically deal with nerves). Write up a Letter of Agreement. Your friend can sue you if something goes wrong. "My friend would never sue me". Um, how to politely put this: stranger things have happened. Weddings are full of emotion and yes, sometimes, even drama. Once your friend is married, their loyalty will be (and should be) primarily to their spouse. You never know what will happen to a friendship. Take the time to write up a document, title it a "letter of agreement", and clearly spell out the requirements of both parties. Make it as complex or simple as you like (I'd recommend simple), just be sure to include a paragraph that says your friend understands you are not a professional wedding photographer, that you cannot guarantee to provide any specific photo, and that you are not responsible for any loss of coverage for any reason. Even WITH that phrase in the letter that is signed by yourself and your friend you can STILL be sued (yet by having that signed letter of agreement, the judge or arbitrator will look much more favorably on you in the situation). However, with that phrase you should be much safer! I'm not a lawyer, and as they always say you should get legal advice from a lawyer, but I definitely encourage you to at least use common sense to handle the legalities. Realize that wedding photography is expensive. Not only will you easily spend 40 hours of time (and hopefully much more if you practice and prepare properly) getting ready for the wedding, photographing the wedding, and then post-processing the photos, but you may also need to buy new equipment or rent equipment for the wedding. You MUST practice your lighting and exposures. You will have a hard time making excuses for bad exposure in the wedding pictures. It won't sound right to simply say "the church was dark", or, "my flash was acting up." Do whatever it takes to go to the venues and take sample photos before the wedding. Write down all your photo exposure information. You need to know what exposure settings to use on wedding day for all of the various locations in the venue where you will be working. I remember a time when I was just getting started in wedding photography and was using 35mm film-based equipment. I went to the church facility on a Wednesday night to take some test photos. After the film was back, I was shocked to see how dark the stage was. I went back and took another set of test photos and was blown away to realize that: my camera meter, light meter, and eye were ALL somehow off from what the actual images recorded. I am so glad I took the test photos in the first place - and that I went back and did more experimenting when the first batch were off. I had never before, or since then, seen the same situation (where my light meter, camera meter, and eye were somehow off) and I still don't know what in the world happened to cause the photos to be dark (and no, I don't think it was the processing because other images were mixed into that roll that turned out fine, and when I went back for another test shoot I achieved the same results and was able to lighten the photos when I adjusted my settings). Even with practice there are still little details that can make or break your exposures. Sunshine streaming through a window or a cloudy day can make a major difference. Or, you could experience a slight technical issue with your equipment. A perfect example of that happened to me in the early 2000's. I was photographing the procession from near the front of the church. As the grandparents came in I took their picture, but I didn't think my flash "sounded" or looked like it had fired as much as it should have for the proper exposure. I was shooting film so I couldn't look down at the camera-back to see the exposure. The interesting thing was that my flash HAD fired. I quickly began troubleshooting and found out the flash shoe had slid back the tiniest bit in its holder and was not fully synchronized with the camera, even though it was still firing. The photo of the grandparents came out underexposed - BUT, because I noticed something was wrong and fixed it, the rest of the wedding procession (including the wedding party) turned out perfect. This is why you must KNOW your equipment. You MUST fully know your equipment and also have backup equipment with you that you know how to use. One camera is not enough. One lens is not enough. One flash is not enough. And, backup is not simply bringing along a spare camera: you have to know how to use it. Make sure all your equipment works and that you have fresh batteries (and lots of spares) on hand. Ask yourself if you would be able to shoot the entire wedding with your backup camera setup - and whether the bride and groom would be pleased with the photos. Make sure you handle the memory cards carefully. This goes without saying, but is critically important. I have a very precise method for how I handle memory cards at the wedding. All of my cards are numbered and the ones I take to a wedding are inventoried. I keep a few empty memory cards in my front right pocket. Completed cards go in my front left pocket until the end of the wedding. Do not lose any memory cards. You may think that is a "no-brainer", but, trust me, on wedding day things are different. More pressure. Less time. Easier to forget obvious details or set something down in a different place than you normally would. To give you an idea of how important this is and the types of steps you need to take to keep track of your cards (and an idea of the type of practical information that will be in the eBook): I label all of my memory cards. The label says "Reward if found" and "May contain irreplaceable wedding photos". It has my name, cell phone #, and web site. I figure if they are lost, I'm willing to pay a "thank you" to whoever returns them. If they are stolen, the label should appeal to the thief's conscience, and/or their practicality: memory cards won't sell for much, so returning them to me should net them a better profit. I knew a wedding photographer who was returning from a destination wedding and lost all of his memory cards at the airport security checkpoint. They were either lost or stolen. He was beyond sick. It hit him so hard, and he was so sick over that, he stopped shooting weddings. When I return from a wedding the first thing I do is to download all the images to my system and sync the files to an off-site location, or burn a copy of all images to DVD or Blu-ray. The media is then stored off-site. This is usually completed that very night. If I'm not able to get the images off-site that night I will carry the memory cards with me until they are safely off-site. At the wedding, if I have a problem with a corrupt memory card I always move on to a fresh memory card. I will then use photo-restore software to recover the images on the memory card. I have experienced a few memory card failures over the years (I blame most on my camera or my computer Operating System). If you think you've lost a memory-card worth of images, you need to be careful how you proceed. I use Photorescue software. And, I'll have an entire section in the eBook about recovering images. Spend as much time as possible preparing for, and practicing, before the wedding. Buy a few wedding photography books. Don't just read the books, though. I'd recommend setting aside at least a 3-to-1 ratio of time for each book: spend 3 minutes practicing and/or replicating what you are reading about in the book for every 1 minute you spend reading. Not including the time I spent learning photography up to the point of my first wedding, I easily spent 120 hours getting ready for that wedding. Consider having a "backup" photographer taking snap shots throughout the day. This is a touchy bit of advice and must be handled carefully. You don't want dueling photographers: one needs to be in charge. And you don't want to overdue the photo presence. However, it would be nice to know that some images are being captured by someone else throughout the day on a separate camera. What equipment should I use to photograph weddings? A fairly modern DSLR with at least 8-10 megapixel resolution. While Nikon and Canon are the most popular brands, there isn't any one particular brand that you have to use. Once you choose a camera system it will be costly to switch. If you are just starting out keep in mind that, often, in the long term, you'll spend far more on accessories and lenses for your camera than the camera itself. I don't have a problem with using 3rd party equipment (a Tokina lens mounted on my Nikon camera). Read plenty of reviews prior to making a purchase. In order to do bounce flash you'll need a "shoe mounted strobe" (although I use my strobe in a flash bracket, so it is not actually mounted into the camera's flash shoe). I have an entire chapter in the eBook that goes into much, much greater detail about equipment with information about cameras, lenses, flash units --- along with advice on the best ways to acquire used equipment. I started using the Nikon D1x ($4,000) when I went digital in March of 2002. I switched to the Nikon D300 ($1,600) in mid-2008. In 2012 I switched to the full-frame Nikon D800 ($3,000). I don't have current recommendations on "best buys" for cameras. I would recommend you visit the following web sites for detailed reviews. In particular, I like the "pro's and con's" that DPReview (when I'm buying a camera I'm as interested in knowing what it DOESN'T do well as what it DOES well - or CLAIMS to do well). What exposure should I use for a candlelight wedding? First: practice, practice, practice. Learn how to use your camera's meter and take a reading to find out the proper exposure. It will vary depending upon how many candles are lit and whether there is any additional ambient light nearby. I can't give you any exact settings that are guaranteed to work. Practice at your own house (or the church) ahead of time. Obviously, if you have a DSLR capable of working well in low light with a high ISO, that will make a difference. A good tripod with a quality lens (with an aperture of at least 2.8, but preferably 1.4) will also be helpful. One important point to remember: make sure your photos are turning out "dim". I have a lot more information in the eBook, but if you use a "proper exposure" for a candlelit wedding the photos will be brighter than the actual candlelight setting. You'll probably be shooting at -1 EV or even -2 EV to properly record the candlelight. Any tips on photographing a candlelit procession? Sometimes they will have the lights on during the procession and then dim them for the ceremony. If there is some natural light you could try using the available light. The key would be to practice in the same lighting conditions ahead of time. You'll probably need a camera that does well at high ISO's as well as an f/1.4 lens. If the ceiling is fairly low (and white), or if there is a light-colored wall somewhat nearby, you could use bounce flash. You could buy another flash unit and set it up on the opposite side of the aisle and use that. Another option would be a strobe setup somewhere else: perhaps up in the balcony or against the side wall of the facility. If you are using a small flash unit close to the aisle you'll have to watch out that the light isn't too harsh. One idea for bounce-flash would be to use a 3'x5' sheet of glossy white poster board as a soft bounce diffuser. You could stand on one side of the aisle with someone on the opposite side of the aisle holding the poster-board. While it may look a bit odd, the results will be beautiful. If you are shooting a candlelit wedding remember that it is OK for the photos to be a bit dark. Your job is to record the event, and the event will be dim/dark. Don't make it look like daylight. What are the largest prints that can be made from 35mm film/5 mega-pixel/10 mega-pixel/15-mega-pixel cameras? Also, keep in mind that all mega-pixels are not created alike. For example, a larger digital sensor (perhaps for a full-frame camera) that is 13 mega-pixels may yield higher quality prints than a 16 mega-pixel digital camera with a smaller digital sensor. The best way to know how large of a print you can make with your camera is to test it. Print an 8x10, 11x14, 16x20 and you can even create some larger prints and see what you think. There is also software designed to help increase the size/quality of images. While I don't have experience with the software, I've heard good things about Perfect Resize from onOne Software. You can also Google for "image enlarging software". It depends upon your style. Obviously the two primary issues are how fast the lens is (aperture) and the zoom range. Quality is another issue but if you're doing your research, buying a good brand, and getting a fast lens: quality should be a given. I like to work with f/2.8 lenses. Combined with my D300 or D800 (great at higher ISO's) I can shoot in a lot of available light with those lenses. I have a 17-35mm f/2.8, a 35-70mm f/2.8, and a 70-200mm f/2.8. I also have a 50mm f/1.4 that I love and use at every wedding I photograph - and is my go-to lens when the lights are off (or candles are the light source). I primarily use Nikon lenses but do have a highly-reviewed Tamron 17-50mm f/2.8 (which cost about 40% of what the equivalent Nikon lens cost) and also a Tokina 11-16mm f/2.8 -- both of those are lenses that are designed to work with a 1.5x focal magnifier and I use them on my D300. While it's expensive, if at all possible, I encourage you to get professional lenses. You'll find that cameras lose their value quickly: but lenses tend to hold their value. I'm using some of the same lenses now that I purchased when I was starting into photography (with film) back around the year 2000 - and they still work great and are worth about what I paid for them back then. If you're not able to purchase professional equipment consider renting it for the wedding. $300 will go a long ways towards getting you some nice gear. Make sure you practice with the lenses prior to the wedding. I recommend a name brand DSLR. Ideally full frame but it doesn't have to be. I used to recommend at least 6 mega-pixels (MP) but that isn't as much of an issue anymore as pretty much all of the cameras are anymore. Searching the web and make sure to visit dpreview.com for detailed camera reviews. The flash unit is as important, if not more important than the camera. I have a really old Canon Point & Shoot digital camera - but it has an external flash shoe. With it, I can take indoor bounce-flash photos that have incredible lighting; no one would guess they come from an old digital camera. When buying a digital camera, make sure you get a quality external flash that allows you to rotate the flash head vertically and horizontally. Nikon and Canon both have nice external flash units, but they are pricey. I'd recommend looking into the Photix Mitros flash units, or the Photix Mitros+ units (which have built-in radio syncing). As your photography improves you will quickly learn that the old adage, "shoot with the sun over your shoulder" is not a good rule to live by. The sun causes harsh shadows and lots of squinting. However, if you are serious about your photography you are going to have to deal with photos that are outdoors in the sun (at times). The best way to deal with that: practice (notice that bit of advice keeps coming up?). Use fill flash, reflectors, any nearby shade, and take a bunch of pictures. Write down your settings and see which ones look the best. Later, go out side and do it all again. The fact of the matter is that shooting in full sunshine will generally result in harsh shadows if there isn't some type of fill light (reflector, diffuser, flash, or it could even be concrete or a light-colored wall). However, I've found there are some types of compositions (for example, with the couple looking at each other) where the harsh shadows aren't as much of an issue. When I am outside I generally prefer to shoot on cloudy days or when the sun is setting (sunset is a wonderful time to take outdoor wedding portraits). However, over the years I've known that if that is all I do I would never get comfortable shooting in full sunshine. Which means I would often start out shooting in "safer" locations and then move out into the full sunshine for a series of photos. Another option is to put the sun behind or perpendicular to your subjects and use fill flash to illuminate them. I love this effect when using my White Lightning Strobes. When I am outside in the full sun shooting photojournalistic coverage and the shadows are too dark I will often shoot with my flash (straight ahead, automatic, -1 to -3 compensation). I do not use any special effects filters for my wedding photography. I do have UV filters on each of my lenses, though their primary reason is to protect the front lens element on my lenses. In fact, whenever I buy a lens I ALWAYS buy a UV (clear) filter that is instantly put on the lens and never comes off (except for a rare cleaning). Filters are easy to replace - scratched lenses aren't. A lot of wedding photography special effects have been overdone in the past: the "soft" focus picture, the "star effect" filter, etc. I don't use those types of effects (plus, they're no longer popular). What kind of flash do you use, and do you have any lighting tips? For the portraits, I used to use two Nikon SB-800's in manual mode (along with the camera being in manual exposure mode). I tried automatic some over the years but would never get consistent lighting (the men, in their tuxedos, always had more flash than the women, in their light colored dresses, did). My second light is usually on a light stand. At the rehearsal night I'll usually setup my lights and do the testing so I know exactly what to do on wedding day (plus, with digital, I can review the images on the screen as I setup). Now I have White Lightning flash units and have been very pleased with them. I use umbrellas and a sync cord to the camera. I don't have to worry anymore about the low power output of my SB-800's. For regular, indoor, non-ceremony, photojournalistic lighting I use a basic yet gentle lighting approach. If there is one thing I do not like, it's the full blast, F11 flash with the black background and the harsh shadows that so many photographers used to use. I always try to bounce my flash off walls (or, if walls aren't available, ceilings). Otherwise, I'll point the flash head up with a diffuser on it and slow down the shutter speed. Because of the f2.8 lenses I use (often shooting at f2.8) and the D300/D800 camera's I use(which do an incredible job even at ISO 1600 or 3200 ), I am usually shooting natural light with some fill-flash (though, again, it's never direct fill flash unless I'm outside). In fact, most indoor weddings I'm shooting ISO 400, f2.8, 1/60th with flash bounced off a wall (with my Nikon SB-800). Bounce flash is a key to my lighting style . I try to only use a little bit of flash and mix it into the scene, and when it comes from the side (instead of straight on) the result is usually beautiful. I love working in buildings with light-colored walls and ceilings that I can bounce off of. Even gyms! It's amazing how natural the gentle bounced light ends up looking. I've even stood in such a way as to be able to bounce flash off a white pillar about 5~10 feet away (in an otherwise dark paneled church) to photograph a wedding procession. Make sure you do lots of practice with the lighting - it's a crucial part of the wedding photography. I recommend you buy at least one new wedding photography book for each wedding. I have setup a section of wedding photography book reviews with links to some of the books I've bought over the years to help you decide which ones you think would be most beneficial. I am not the type of photographer that shows or projects my photos at the reception for the guests to order prints. My view is that the reception is to celebrate the wedding, and it is not an opportunity for me to “peddle my wares” and try to make additional sales. On top of that, during the reception I am completely focused on taking additional photos and it’s VERY rare for me to sit down at all (whether it is to eat or rest). If I wanted to begin selling prints to guests I would likely launch an e-commerce application on my web site. How long I am at the wedding (I can easily take 100~150 shots per hour; I've been at some 10+ hour weddings and my shot count is usually quite high for those; on shorter weddings I’m usually pushing myself harder to make sure I get a good amount of quality images). It’s hard to phrase this one: but, how “scenic” the wedding is, or, how much action is going on. At a wedding involving a couple from large families, with lots of friends and guests, held at a scenic location, with lots of cute kids running around, and a large wedding party, combined with a long wedding service and lots of formal photos ---- I tend to end up with a lot more shots. Whether or not I have an assistant, and my assistant's skill level (my clients don’t get a choice of assistants – but, generally, the assistants I've been working with lately are family and they are skilled). I’ll generally sync all the clocks in the cameras before a wedding. My assistant will usually shoot the backup camera. After the wedding, I’ll dump all the photos from both cameras into one folder, sort by time, and rename them with a four-digit number (0001, 0002, 0003, etc.). Then, I process all of the images in Lightroom. I do pull out some rejects while I'm processing the images. Photos that look odd or captured a bad moment for the subject, or that the exposure was way off. In general, though, I try to include as many images as possible. It's not uncommon for me to shoot 2,500~3,500 images (or more) at a wedding and deliver 1,500~2,500 images. Keep in mind that all of the above represents “me” – not others. Other photographers' shot counts will vary significantly. I know of some photographers who shoot about 500 photos at a wedding and that works great for them. I know that some photographers have the mindset that only about 100 or so images will end up in the wedding album - so why shoot lots of images. My thought is: I shoot every single good shot I can, and my goal is to give my clients the best possible 1,000, 1,500 or even 2,000 images to choose from when they build their album; but I don’t ever shoot mediocre or bad shots just to try and bump up the shot count – I’m always looking for good compositions/scenes/lighting/moments. Question: "My friend is a pro photographer and she only shoots in "P" (auto/program) mode; I like to shoot in "M" (manual) mode, but her pictures come out very nice and my pictures come out very blurry. Do I need to use a tripod?" I’m a little surprised your pro friend only shoots in “P” (program) mode… Yet I’m also a bit surprised you shoot only in “M” (manual) mode. Perhaps you do that because you've heard you get better results that way? (which is not necessarily true) Also, blurry results may not be only a result of manual mode. If I set my camera in manual mode with a shutter speed of 1/5000th of a second, it will not be blurry (but it will likely be dark). If I set my camera in Program mode and it selects a shutter speed of 1 second, and I handhold the shot, it WILL be blurry. I will often shoot manual mode when I know the exposure will be consistent (perhaps during formals, or the wedding ceremony). But I will very rarely ever use “full program” mode. Often, when I want the camera to help with exposure settings it is because I’m in a situation where I don’t have time to be constantly setting the exposure. That includes a lot of my photojournalistic coverage. However, in almost all of those settings, I still want some control. Interestingly enough, the control I usually want is over the shutter speed. As a result of that, I will usually set my camera in “shutter-priority” mode. So, the vast majority of my photojournalistic shots that are indoors with bounced flash, will be with shutter-priority exposure. Indoors (with bounce-flash), I usually set my ISO to 400 (but will bump it up if the interior is dark), and set the shutter speed to 1/120th. Again, if the facility is dark I’ll slow it down, perhaps all the way to 1/60th - but I have to be careful of blur when shooting at 1/60th. Another factor is what type of zoom lens I’m using. The greater the zoom, the faster shutter speed I need. Most of my shots are on my 35-70 zoom; but I do sometimes go with a wide-angle 17-35 (in which case hand-holding 1/60th isn't so bad); but when I use my 80-200 (non vibration reduction) I would generally shoot at a minimum of 1/125th shutter speed (or faster). If I use my vibration reduction 70-200 I can shoot with 1/60th of a second. If I am out in the mixed sun-and-shade, I might use full-program mode. Or, I might still stick with shutter priority to make sure my shutter speed is as fast as possible. And, all the time, I’m mixing in manual shots for when I want control over shutter speed and f-stop. So yes, your blurry photos might be a result of your manual mode – but that is only if you are setting your shutter speed too slow or don't hold the camera steady/still. A good general rule of thumb for hand-held shots is that your shutter speed should never be slower than your focal length. If you are shooting at 50mm, try to be at least 1/50th of a second or faster. If you have a zoom lens that is a 200mm zoom, you’ll want to be at 1/200th of a second (or faster). And yes, a tripod will help fix blurry photos. It’s just that it is impractical to carry a tripod around all the time. I try to use a tripod whenever I conveniently do so. At weddings, that would mean the formal photos and perhaps some of the ceremony photos. In fact, getting natural-light photos during the ceremony often requires a slow shutter speed (sometimes 1/8th of a second) – doing those shots hand-held would be impossible! Question: "What image editing software do you use? " I use Adobe Lightroom for editing images. I used to use Photoshop but have found that Lightroom does everything I need - and I love the batch processing capability, as well as the ability to quickly apply settings from one image to another. Question: "I love blurred background images. If you have any tips to this technique it would be greatly appreciated." This is another one of those effects that a lot of amateurs want to learn about (and it is simple to achieve). The key is to use a wide-open aperture and/or a large zoom lens. The standard approach is to use a lens with a really low aperture (f2.8, or even f1.8 or f1.4). I have an 80-200 f2.8 lens which I love for that effect. By setting the lens at f2.8 and using the zoom portion of the lens, the background will be beautifully blurred out. Wide angle lenses don’t have the same effect (using an F2.8 lens on a 17mm wide-angle would not result in much background blur). Sometimes I will specifically be set up with my big lens quite a ways from someone (30 or 40 feet) so that I can shoot wide open and blur the background. You need to also make sure the background isn't close to the people as the distance is what results in the blur. Question: Do you allow other photographers to take pictures at the wedding? Answer: Yes, I do. And I created a separate page to explain to couples my philosophy in allowing other photographers to take pictures. Also, here is a page which shows a few angles I always try to get at weddings. Question: Where are some good places to arrange the light units at the ceremony if you only have one softbox and one umbrella? I usually don’t use strobes or artificial lighting during the ceremony. If I had to, I would try and use it from a distance and have it be VERY broad/gentle by the time it hits the front platform/stage. In your example I would probably not use the softbox or umbrella, but would try to simply have the strobes at the very back of the church, shining at the back (hopefully white) wall and with a reflector to focus the light a bit. If the back wall wasn't white I would probably find a way to attach a poster-board or two back there and have the strobe bounce off of that. The light would be very gentle by the time it hit the front (because the light was reflected off the back wall which would make it a large light source). Actually, I've done something like that before at several facilities (one church and one theater) – but, usually I’ll just use fast lenses (f1.4 or f2.8), a tripod, a high ISO, and slower shutter speeds (I have successfully shot ceremonies with shutter speeds at 1/15th of a second – but if I was shooting with that slow of a shutter speed I would take lots of extra shots because I'll blur some and the subjects will be moving in others). If bouncing off the back wall isn't an option I would try to have the lights set up equidistant from the front on both the left and right side. I would try to get another umbrella and would use two umbrella’s instead of the softbox (the softbox works great for close-up lighting, it doesn't do very well at distances of 20, 30, or 40 feet). For lighting the formal photos after the ceremony in the sanctuary I generally set up two umbrellas, large ones to help soften the light a bit (my largest umbrella is 7', but also 5' and 4'). Even when using my strobes/umbrellas I try to mix in some natural light - so I don't end up with shadows that are too dark or a dark background. Usually a slower shutter speed will help bring up the ambient light in the background, and it isn't uncommon for me to use a shutter speed of 1/30th during the formals just for that purpose. Question: Is it possible to photograph a wedding without any flash of any sort? I use a Canon Rebel XTi and never use a flash for my personal photos. I see lots of lighting info with flash stuff, but I really don't want to invest in that right now. I could rent them, if needed, but I don't really know how to use them at this point. The bride contacted me a week ago and her wedding is this Saturday (not much time to prep). The wedding is in a well-lit church at 11am, then going directly to reception at a well-lit hotel. Again, small wedding, not requesting many formal shots. For me it would be tough to shoot a wedding without any flash as I use flash quite a bit. I do know of some wedding photographers who used to shoot for newspapers and who prefer to shoot without any flash and it's their style. Their images have a certain look to them, and they are often shooting with high-speed lenses (F 1.4) and high ISO’s (1600 and higher) in order to get the proper lighting. However, it sounds like your background experience is primarily natural light, and with well-lit venues - go for it. The challenge will be if you find yourself in a situation with some dim lighting (perhaps a hallway) where you may be tempted to use the pop-up flash - and that wouldn't be good. As you know from my site, I believe the key to successful flash photography (especially at a wedding) is to make it such that it is impossible to tell a flash was used. And, with a pop-up flash, there is almost no way to hide it (I have seen some diffusers for pop-up flash and you would want a diffuser if you HAVE to resort to using the pop-up flash). The only way I have found to effectively "hide" flash is to use a full-size flash and bounce it off a ceiling or wall. If you have been using a pop-up flash up until now it would be tough to suddenly learn bounce flash in time for the wedding. So, I guess, the bottom line is this: if the bride has liked your current photos, you should be fine to shoot the wedding with your current style. The only concern would be if the bride is expecting something different than what you are currently shooting. And again, for me, I would prefer using no flash (which would likely require nice F 1.4 or F 1.8 lenses) than using a pop-up flash. Question: I am photographing a wedding this month and will be dealing with divorced parents/step-parents. There is animosity between the divorced parents and the children involved. When doing the formal photos how do you deal with this type of situation. The bride says she only wants a picture of her and her mother. She does not want the mother in the formal family pictures. Suggestions??? Divorces are tragic and can definitely result in complications to the wedding photography. It's good that you're planning out the formal photos and groupings ahead of time. I'm there for the bride and groom. The parents have made their decisions and have to live with them. If there are hard feelings and the bride/groom don't want photos with a certain relative, I'm not going to force them to. On the other hand, if the bride/groom invite their parents (or the parents' new spouses) to the wedding, I'll usually end up taking pictures of them because they are there. I try to be as conciliatory as possible during the photos. I don't want to be the one making a bad situation worse. I want to be known as the person who tried to make the best of any situation. It has been very common at the weddings I've done which involve divorced parents for the divorced parents to be willing to be in a combined photo with the couple, one on each side. Then, each of the divorced parents will usually ask for a separate photo with the couple and I'll usually do it because it is quick/easy. It helps to know who the divorced parents are so that you don't accidentally ask them to stand together! As to the specific situation you mentioned when the bride doesn't want the mother in the formal family photo - if it was me, I'd honor the bride's request. Sure, I may question her in the preplanning to confirm what she wants: perhaps she feels the father was the one through the divorce who stayed faithful to the family and she feels it would be dishonoring to the father if the mother is included in any of the formals. Maybe she would be OK if the Mom is in a formal, just so long as the father is not included? I would also ask the bride what she would like done if the mother specifically requests a photo during the formal photo session so that you know how to respond, not that the bride has to give you the words, but if the bride is firm in not wanting a photo even if the mother requests it, then you need to know what you would say. My approach would probably be to focus on just the shot list. I would announce the groupings by individual name rather than just saying "Bride's family" (because then the Mom would think she would be included). I would also plan the session such that I wasn't calling up everyone except the Mom at one time - perhaps start with a photo of the couple and the father, then add in a few siblings and you have the family minus the Mom. If the bride is OK having a photo taken with the mother in it yet she just doesn't plan to have the photo printed, that's easy. Build your way up to a photo that would include the mother and then start subtracting from there. Make sure you have the key photos without the Mom, even if you get a photo or two with her in it. The bride can then choose which photo she wanted to have printed later on. I recommend every beginner buy at least one wedding photography book prior to each wedding they do. You can get more than one, but my main thought with recommending a lower quantity is that if you get too many you'll be tempted to simply look through them all, rather than spending the time to practice what you are learning about in each book. My shelf has a variety of wedding photography books on it. I started this section back around the year 2000 when there were not many books to choose from, and the ones that were available were VERY traditional. 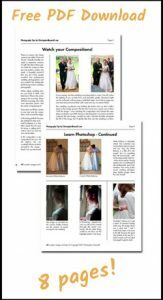 The goal of this section is to provide you reviews and convenient links to the some of the wedding photography books available from Amazon.com. I have yet to find a book that has comprehensive advice for the ammeter who is starting out. That's why I'm working on creating an eBook. However, I still believe there is much value in the currently-published wedding photography books. My original goal was to simply link to the Amazon.com book pages. However, full disclosure, I decided to go ahead and join Amazon's referral program. When you click the following links, the book will cost the same amount as if you simply visited Amazon.com and searched for the books, but I will receive a payment (often about 1% of your purchase) from Amazon.com. The amount I earn is currently about $5 or maybe $10 a month. Edition #1 of Steve's book has been my top recommendation for a wedding photography book. This is now the third edition. I would have to say it's tied for first place in my recommendation list. Steve has been in the business for many years, he's highly skilled and phenomenal at what he does. The book has a great section on posing - it's one of the best features of the book. Steve worked with a group of models and gives MANY sample photos of how to arrange single, double, triple, and larger groups of people. He'll show good and bad examples, along with a lot of text explanations. I use many of his tips to this very day. He has good information about his equipment (at the time it was published he was shooting with 2x Nikon D300's), marketing, etc. A significant portion of the book is Steve going through the shots he generally gets at weddings. He gives any tips/tricks to go with each one, along with how many poses or shots he tries for. Not all of the images in the book are his - and he doesn't have charts explaining how each image was setup and lit. There isn't much information about bounce flash. Because it's the third edition and Steve has been shooting for years, there are some older images in the book, and the foundation does seem to come from back when he was shooting medium format. However, he's made a great transition to digital and I believe he is one of the best at posing. Overall, I said that this book ties for my #1 recommendation. If you are looking for one book that's an overall introduction to wedding photography, if you want a greater emphasis on posing: this book is it. If you want a greater emphasis on technology/software/workflow, it would be the next book: Digital Wedding Photography, Capturing Beautiful Memories. Glen has done a good job putting together an all-around guide to digital wedding photography. This book is tied as my #1 recommendation, with less of an emphasis on posing and a greater emphasis on software/workflow. The main drawback to this book is that it's not "my style". I'm guessing that Glen has probably been shooting for many years and that a number of the photos were pulled from past years. He has quite a few really good photojournalistic images, but, again, a good portion of the images just don't appeal to me. He has good information on various light setups and some samples of what each one can look like. He has quite a section on Photoshop - I personally think Lightroom is now the workflow tool of choice for most photographers (albeit, knowing how to post-process images in Photoshop is still a great skill, I would simply recommend you prioritize learning Lightroom over Photoshop when starting out). There is a lot of really solid information in more than 350 pages. He goes into good detail on post-processing, workflow, studio management, web site, etc. Part of the challenge is what I'm finding in putting together an eBook: there is SO. MUCH. INFORMATION. that it is hard to fit into one resource. Because Glen does a good job giving an overview to everything, I do recommend this book - even though my style preference is different than his. So, if you are looking for a good introduction to wedding photography with a greater emphasis on workflow: this is it. If you are looking for a greater emphasis on posing, check out Digital Wedding Photography, Art, Business & Style by Steve Sint. Neil does a great job explaining bounce flash in his book. If you want to learn bounce flash and are willing to invest the time it'll take to practice, this is a great guide. The only negative I have with this book isn't really a negative. It's basically that the book "works" for beginners, but is also definitely targeted to professionals. Don't let some of the advanced techniques turn you off to bounce flash. For example, when I bounce indoors I'm typically happy to get a great-exposed subject with beautiful lighting. If Neil has a bride in front of a window, though, he wants to balance in the interior exposure with whatever is visible through the window. Looks great, but is a bit more complex. Same goes with color balancing the flash using gels. If you get this book make sure you practice the various techniques. And again, don't let the advanced techniques dissuade you from learning the basics, which I believe are vital to your success in wedding photography. This is my #1 book recommendation on learning bounce flash. This is the 3rd edition of Rick Ferro's book (published in 2004). I currently have it on order. His first edition was my #2 recommendation for a good, general, wedding photography book. I'll update this when I receive the new book. A good book with excellent photos. Rick focuses more on traditional photography. He provides illustrations of his lighting on practically EVERY photo throughout the book (which is very helpful information). He provides a shot list at the back of the book - and the entire book focuses on one section of wedding photography at a time (make-up, posing, ceremony, formals). He doesn't discuss the business aspects as much. His work is excellent, and the best way to use the book is to buy it and put it into practice. It hard to find such beautiful locations as he works in, but, get out and try to find a location with some arches. Setup a light (if that's all you have) or two and see how close you can get to his photos. While this book is a slightly dated (published in 2008: a number of the images were captured with a D1x and D2x) this is a nice overview. I would say it's a lot like sitting down with Damon and having him spend an hour or two sharing with you about wedding photography. Emphasis is definitely on natural light. The flash that he uses seems to be direct with little-to-no bounce flash, and definitely no explanation of bounce flash. He has a few nice photos of the bride or groom (half length) with a diagram that shows the lighting he used - often a reflector. At the time the book was written photos of brides up against a colorful wall were definitely in style (not that they are out of style now). He's got a great shot of a bride against a red wall (not the one on the cover) near the back of the book. The photo is about a half-length shot. Next to the photo he shows that it was actually a tiny entryway to a building, perhaps 10 feet by 8 feet. The key being that you have to learn to spot those types of locations. While the book is a nice all-around book, it's not comprehensive. Again, it's like sitting down for a nice chat with Damon as he shares with you about wedding photography. One of the greatest challenges for most wedding photographs as they are getting started has to do with posing. While I don't know Bill Hurter personally, from what I can tell he's great at what he does and is better than I am when it comes to posing. The book is a good resource on posing. What surprised me, though, is that it didn't "wow" me. I thought I would come away from the book thinking, "Everyone needs to read this!" - but I didn't. I think part of the reason is that a lot of the learning in the book is done via text/writing. There are example photos, but it's different than, for example, the section in Steve Sint's book where he has models who illustrate the various poses (good and bad). Probably because I had previously read Steve Sint's book I was expecting more of those types of posing examples in this book. If you are weak in regards to posing, I would recommend you read this book - yet it's not my #1 recommendation as Steve Sint's book has a really good section on posing. Granted, this book has more info, which is why you'll still want to consider it. You may want to compile notes from it to help you remember the key points that you're working on/focusing on - and don't forget to practice what you are reading. While this book is dated and out of print, considering it's often available used for $.01 (with $3.99 shipping), I think it's a reasonable value. Previously this book was my overall #3 recommendation. Sara shoots medium format, 35mm, and digital - so the book has a balance of information relating to those three camera formats. Like me, she can't stand strong "flash shadows" in the background and will retouch them out of photos when they do appear (she works hard to avoid them and often uses several strobes to light weddings). Some of details that she discusses include: photographer attire, vocal authority, working with an assistant, framing and vision paths, preventing equipment failures, special supplies to carry, the zone system, types of light, reflectors, synchro-sun techniques, combating the problems of strobes (namely: harsh, amateurish-looking straight-on illumination and the terrible looking shadows that also show up in the background); dragging the shutter, editing for impact, 19 post-production steps. Bambi is one of the pioneers of wedding photojournalism. The book is out of print yet often available used. While her emphasis is on photojournalism, Practically everyone who is a photojournalistic photographer (myself included) does generally still shoot posed photos, yet it needs to be done quickly and efficiently. I do not own the second edition of the book, which is more focused on Digital Photography. From what I was seeing in the reviews the 1st edition was better, so I didn't get the second edition. I'd say this is a lighter, more "fun" book. It's not heavy on technical information or diagrams. The only way to purchase this book is used, where it's often available inexpensively (currently $0.12 + $3.99 shipping). This book was published in the year 2000 but is still available (new as well as used). It's a bit dated as digital was just coming out at that time. While it may be a fun book to own, I wouldn't consider it a "must-buy" book filled with practical suggestions. David has a lot of good images throughout the book - which is divided into logical sections (new vs. traditional styles, new wedding styles, bridal portraiture styles, selecting film, components of the new styles, the details, etc.). However, he doesn't go into a lot of practical suggestions or exposure information for the images. Several images in the book show up multiple times. For example, his image on the front cover appears two places in the book (that's a total of three times, if you include the cover). Again, a fun book that does have some ideas, but, if you are like me when I was just beginning and only have the funds for a book or two, stick with some of the others until later. If you were to purchase this book I'd recommend you look into the used books (currently available for $0.77 + $3.99 shipping). This book was published in 1999 but is still available (new as well as used). Barbara's book is very similar in style to Bambi Cantrell's book (reviewed above). Barbara uses a lot of high speed, black and white images shot in natural light. If you are trying to develop an eye for photojournalism, this could be handy. She shares a lot of philosophy on what she looks for and watches during the day. Little things like the groom helping the bride adjust her earnings, bustling of the wedding gown, any time the bridal bouquet is put down, etc. She has a little extra freedom to pursue those types of "special" and "unique" photojournalistic shots because she works with her husband, who is responsible for more of the traditional photos. If you are working with an assistant and you want them to try and get some of the extra little photos, this would be a good book to go over with them. For example, I have found that some of the best people interaction shots can be taken while the main "posed" formals are being taken - but are best taken from a different camera at a side angle. Those are the types of issues mentioned in the book. If you were to purchase this book I'd recommend you look into the used books (currently available for $0.01 + $3.99 shipping). Capture the Moment is a book written for brides and photographers that was published in 2002. It would have been nice if it it had focused primarily on the photographers point of view. However, Stephen has a very good photojournalistic style - and the book has A TON of pictures in it. He has some really good images spread throughout the book. For example, one of the absolute hardest posed/formal photo to achieve is what I call the "relaxed casual group photo." This is where you have a photo of people that were obviously posed together, but they aren't standing and smiling at the camera - one of them is cutting up, or they are pointing at someone, or talking amongst themselves. Stephen has several of these examples in his book and gives information on how he achieved the photo. Stephen appears to be based in the UK - so some of the facilities and styles look a bit different, but, all in all it's a good book. Not an all inclusive "buy-this-book-first" introduction to wedding photography, but a reasonable wedding photography book. The book focuses on most aspects of the wedding: from equipment, to selling yourself, to booking a photographer - then the actual wedding itself, followed by a few pages of photos from a number of weddings. At the time the book was published Stephen was using 35mm film cameras. If you were to purchase this book I'd recommend you look into the used books (currently available for $0.26 + $3.99 shipping). This book was revised in 2001 - so it's dated. However, George does a good job going through a detailed shot list and giving examples/information about each. When you're starting out, even if your goal is to shoot most everything from a photojournalistic standpoint, this book can be helpful in handling the formals.